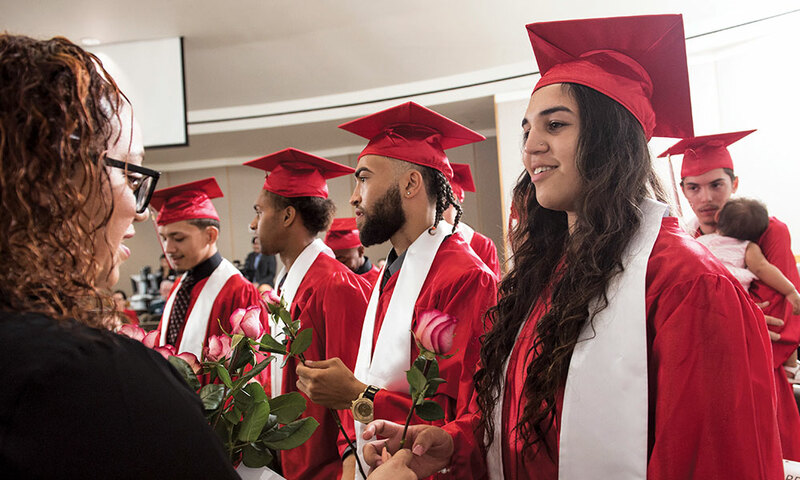 What happens when you combine high-school dropouts with a small, but mighty team of educators and coaches, and give them a chance to earn a Diploma and get job training? 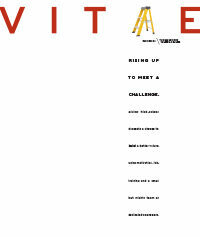 They start building a future. hris Rivera struggled in high school. Not in his classes, actually, but in one small arena that would spoil his memories of high school. He couldn’t pass the reading for the Florida Comprehensive Assessment Test. 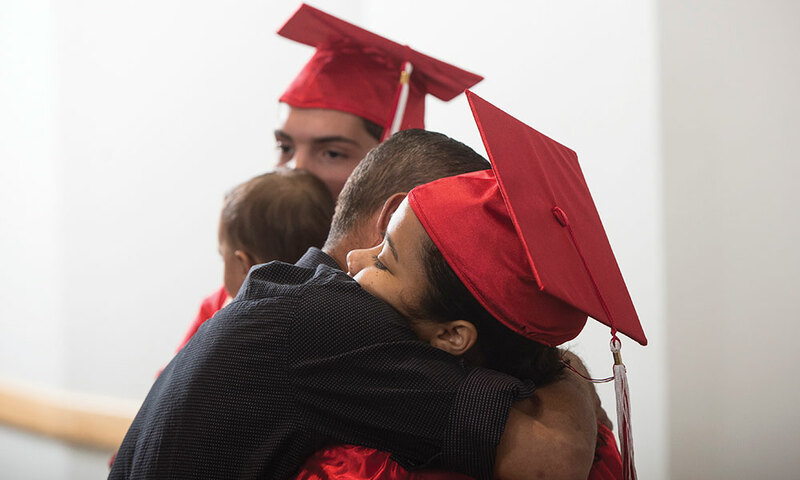 Chris completed high school–earning all the credits he needed to graduate and passing all his classes. But he fell one point short of passing the FCAT for reading. By the end of his senior year, Chris was frustrated and defeated. “I had a mental breakdown. I couldn’t do it anymore,” he says. Without a high-school diploma, Chris threw himself into work, first in the home-building industry and then landscaping for new homes. But his mom kept bugging him to go back and get his GED. Without a high school diploma, she reminded him, his options would be limited. Chris, who’s 20, resisted and, instead, focused on working in the construction field and then landscaping. But when his mom heard about Valencia College’s YouthBuild project—a program that helps young people earn their high school diplomas while teaching them construction skills—she signed him up. After six month in the program, Chris has earned his high school diploma and seven nationally-recognized construction-industry certifications. Today, he’s taking welding classes at the College’s Advanced Manufacturing Training Center. 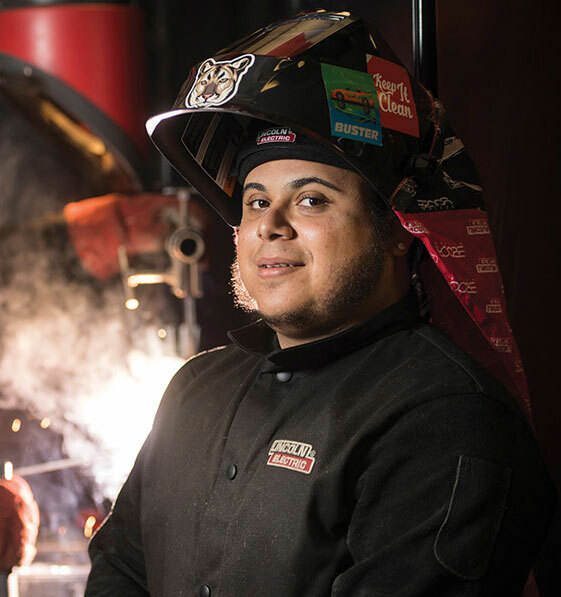 After graduating from YouthBuild, Chris Rivera is studying welding at Valencia College's Advanced Manufacturing Training Center. For Chris, and dozens of students in Osceola County, the YouthBuild program is opening doors, by giving them a chance to earn their high-school diploma, while providing them with job training, teaching them life skills and participating in community service so that they can give back to their communities. Modeled after a program founded in East Harlem in 1978, YouthBuild now has programs across the country and helps about 10,000 students each year. 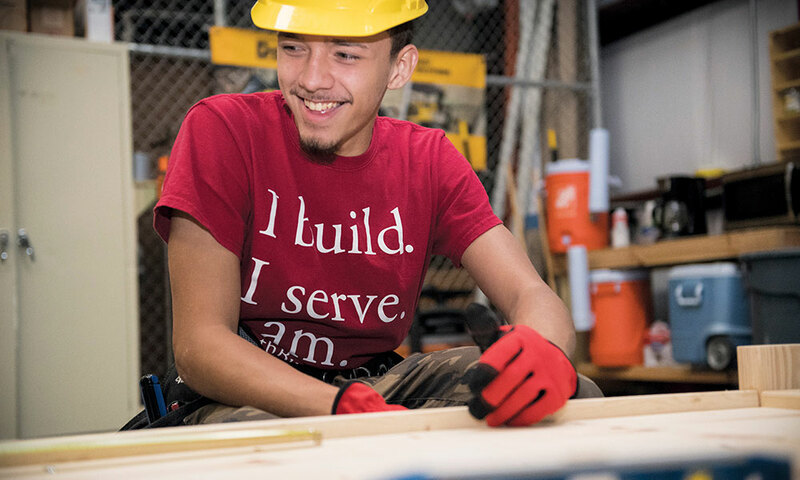 The YouthBuild program, which was launched in July 2017, is funded by a three-year grant from the U.S. Department of Labor. Moms are the number one recruiters for the program, says Sanchez, who grew up in Osceola County and knows the territory. As a former counselor and administrator for Covenant House, she also knows how young people can get tripped up along their journey. 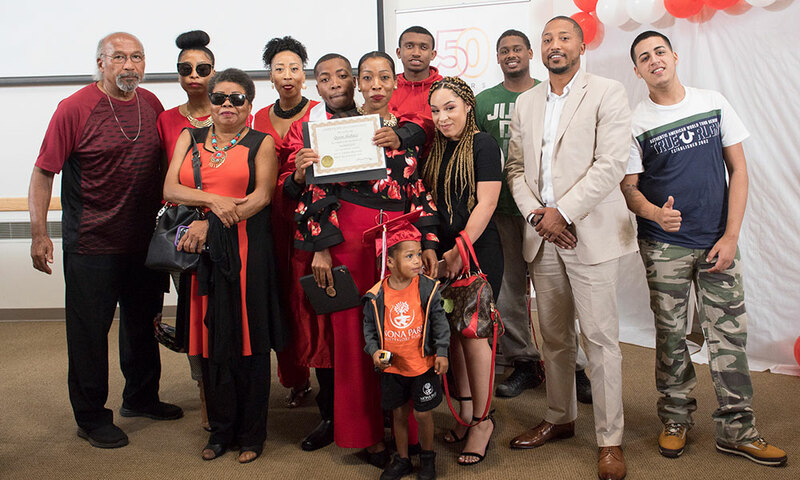 But YouthBuild, she says, gives them a chance to earn a diploma, learn life skills and job skills—with the benefit of a team of advisors and teachers who are working with them one-on-one. YouthBuild instructor Darlene Ramirez helps Ramaiyah Bell prepare for an upcoming test. Darlene Ramirez, YouthBuild’s GED instructor, coaches the students on algebra in preparation for their math test. In class, Darlene Ramirez reviews information with students Ramaiyah Bell and John Moreno. John Moreno is putting his newly-learned construction skills to work. Today, there are 37 students in the College’s YouthBuild program and another 15 to 20 are starting classes soon. Monday through Thursday, the students divide their time between studying for the GED test each morning and then spending their afternoons in construction classes. The students move at their own pace in the GED testing. Some earn their diploma in two months; others may take six months to earn it. 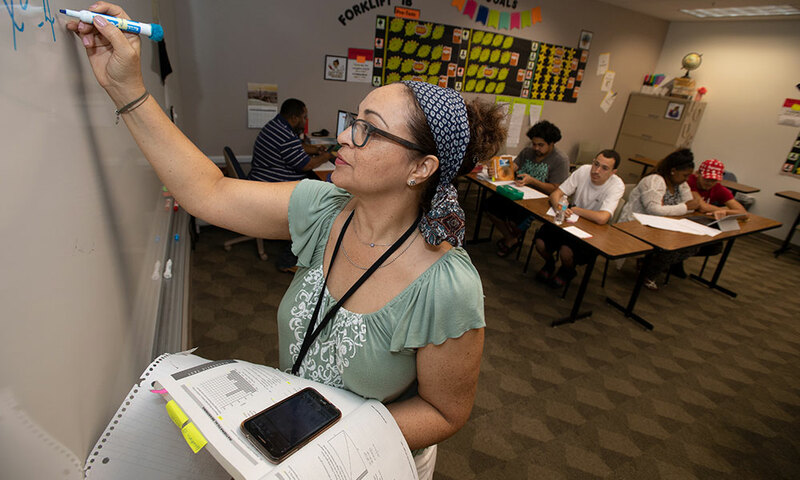 Although many programs aimed at drop-outs pay students a weekly stipend—to ensure that the students will keep showing up for classes—Sanchez and her team suspected that wouldn’t work. So she and Clark meet with each student and establish both short- and long-term goals for the students. Every time they meet a goal, they get paid. The amounts vary: attend the first week of class every day and you can earn $150; create a resume and you’ll earn another $25; open a bank account and you’ll earn another $25; take and pass one GED pre-test and you can earn another $150; complete your first-aid/CPR certification and you’ll receive another $50. Altogether, students can earn up to $2,600 in incentive money, says Sanchez. One of the biggest incentives is completing 36 volunteer hours at Habitat for Humanity which pays a student $288. Everyone comes in with slightly different objectives, so Clark tailors goals to suit the student. One student wanted to buy a cell phone, so Clark set a short-term goal for him: Research all the different cell phone plans and do a Powerpoint presentation on cell plans for the class. “He did all the research and did the presentation on it and, by the end of his presentation, he convinced all of us that we needed to be on Cricket,” said Clark. The students are also required to give back to the community, in the form of constructing a building or public service. So on Fridays, the team heads to the Osceola County Habitat for Humanity ReStore to perform community service. And, over the next year, when the local Habitat affiliate has property ready for a house to be built, the students will help construct the house. Until then, the YouthBuild students have helped remodel the ReStore, unload trucks and built furniture, including coffee tables, bookshelves, picnic tables and Adirondack chairs, to be sold at the Kissimmee ReStore. Of course, not every student wants to make a career in the construction business. But they’ll leave the program with the skills that will make them immediately employable—or a good homeowner. Yet for many, it’s the diploma, not the work training, that is most attractive. Most want a diploma, not a GED, which to some students carries a stigma. Some got in trouble at school and got kicked out as juniors or seniors. But about half the students finished high school, but couldn’t pass the FCAT. And they are scarred by the frequent testing in school. Twenty-year-old Ramaiyah Bell is learning to overcome test anxiety. As a senior at Gateway High School, she couldn’t pass the FCAT—though she passed all of her classes and earned a certificate of completion. But at YouthBuild, she’s rebuilding her confidence; and building a future. 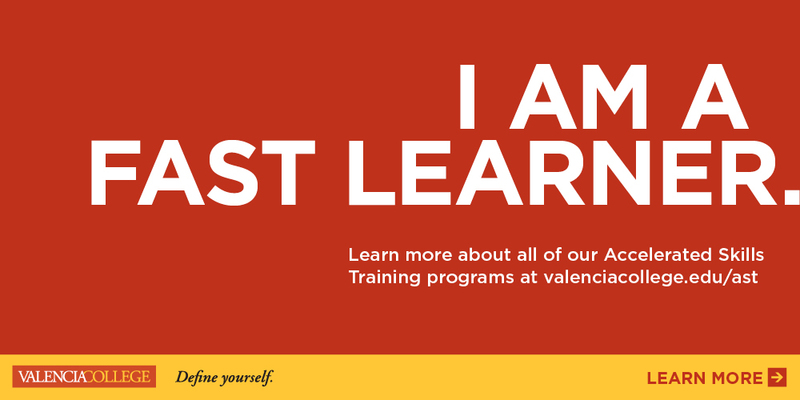 Valencia College is opening other doors for students in the program. 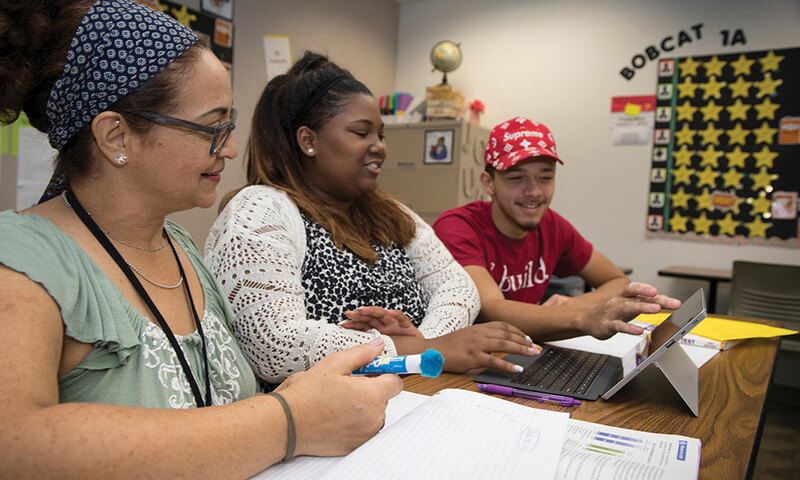 At Osceola Campus, the YouthBuild students are indistinguishable from other students and now they are surrounded by students who also want to be achievers. The college has also helped students fit in. Not only do the YouthBuild students receive ID badges, they also get the perks of being a Valencia College student, including free Lynx bus transportation. And, when YouthBuild students went to the campus math tutoring lab for help studying, the lab director provided a dedicated tutor to help them prepare to pass the math requirements for their diplomas. 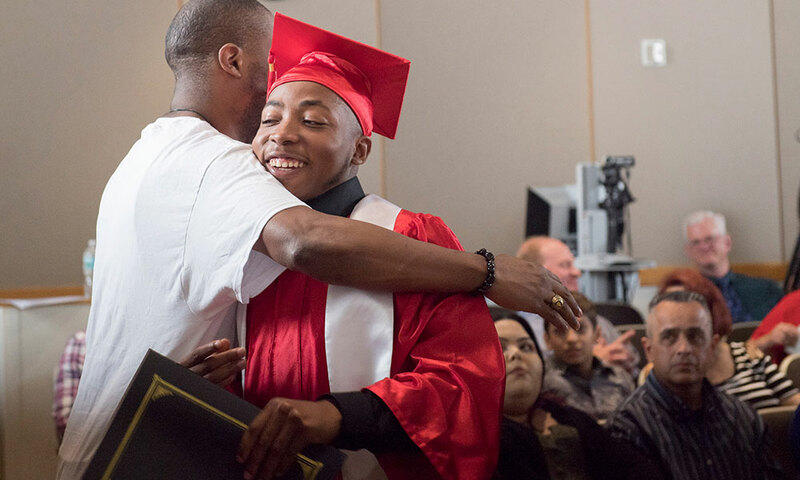 YouthBuild graduate Quran Shabazz earns a hug from a family member at graduation ceremonies. 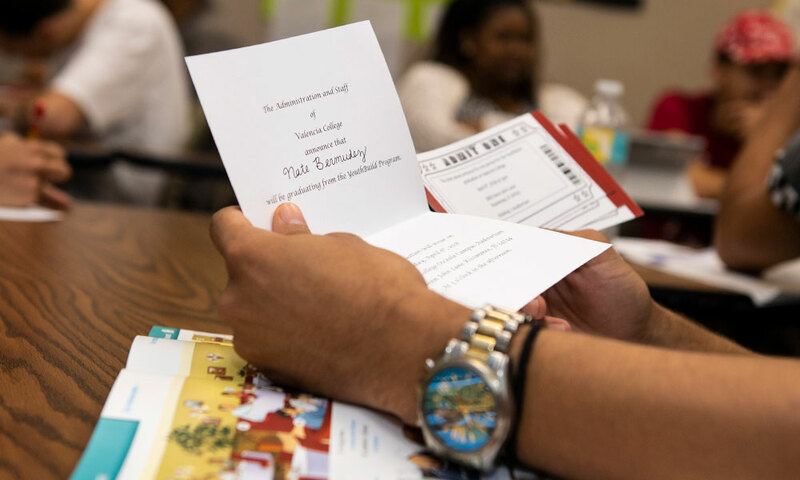 YouthBuild students are excited to receive a formal, printed commencement invitation after they earn their diplomas. Ninna-Lee Alejandro gets a hug, while her boyfriend, Anthony Pujada, also celebrates his graduation. The graduates weren’t the only ones who were proud of their achievements. Families lined up for photos with their YouthBuild grads. In 11th grade, Quran Shabazz dropped out of Osceola High School, where he’d been more interested in distractions than in schoolwork. But at Valencia College, Quran has discovered new purpose. “I am surrounding myself with smarter people,” he says. Though he found the class work challenging at first, he’s proud that he has used his incentive money to help buy a truck. As the students move through the program, the four YouthBuild staffers routinely ask them about goals, and help them figure out their next steps. 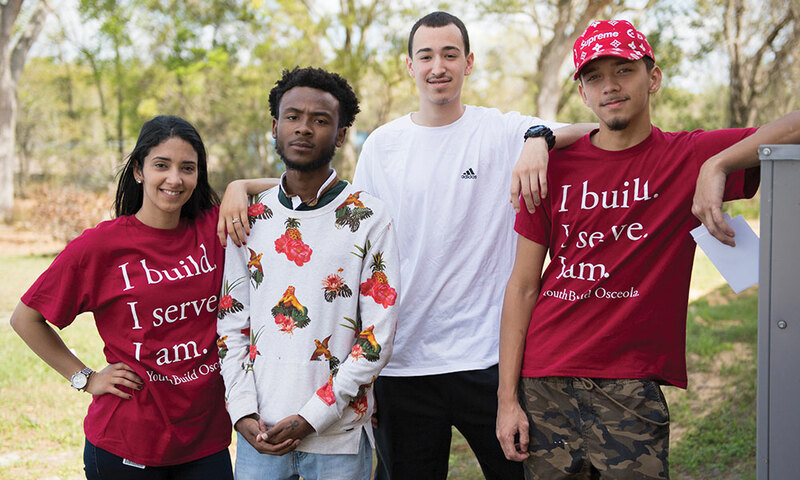 After Quran earned his high-school diploma, he sat down with Eneydi Rivera, a staffer from Career Source Central Florida assigned to the YouthBuild program, to decide on his next step. In many cases Career Source will pay for the students to continue their education. “I loved the construction training,” Quran says. 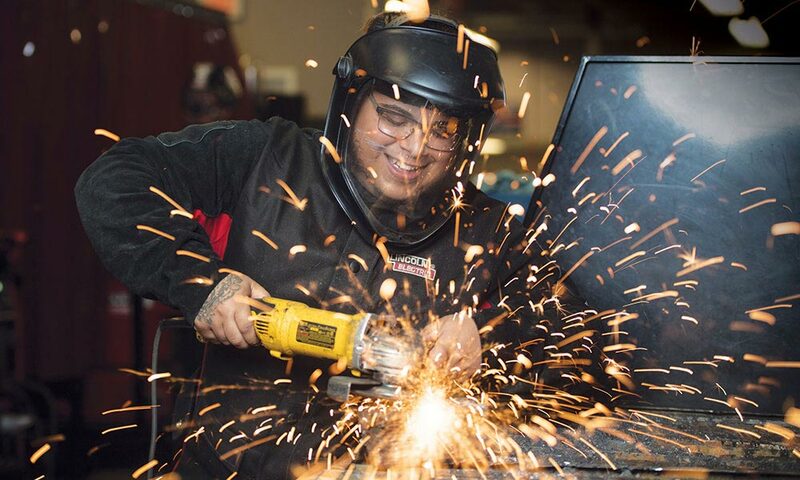 “I liked the hands-on part of the class and I was glad that I could learn from experienced people.” With just one more test to pass before he earns his high-school diploma, Quran is looking forward to his next step; enrolling in Valencia College’s heavy-construction equipment program. The nine-week program teaches students how to drive and maneuver bulldozers, front-end loaders, backhoes, articulated trucks and excavators. Yet, for many of the students, the greatest lesson they’ll learn is that they can overcome the odds and earn their diploma. It’s a lesson in confidence, goal-setting and achieving what they thought they never could.